Even though Jim Sellers has been a professional writer for 20 years, he’s just getting started. He began his career in television production, working behind the scenes in drama, music videos, commercials and news. He was writing screenplays for TV series and documentaries by 1994. His work includes a YA series called Mentors and several projects with the National Film Board of Canada. The switch to writing fiction came when he was a single dad and started reading the books his kids were into. The book industry was changing with the success of Harry Potter and other similar stories that broke from the tradition of “classic children’s literature” to something more relevant and exciting to young readers. He began to make up his own stories to read to his children. They challenged him to come up with better stories, to create longer ones and answer the question “then what happened?” This became a nightly ritual and the stories that they asked to hear over again, he wrote down. The first of these, Jacky the Brave, was published in 2013. It took 10 years of pitching, editing and rewriting until the book was finally published by a small press. 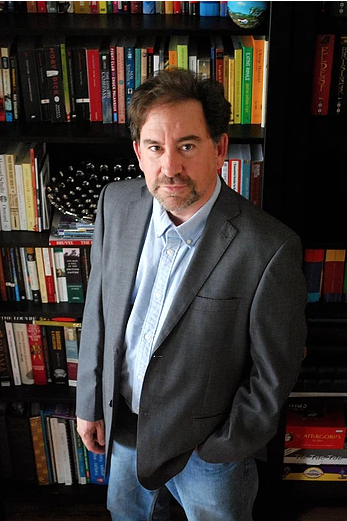 Since then, Jim has published several short stories on websites in the UK and in a short story compilation published by the University of Alberta in 2016. His most recent YA novel, A Death of Cold, which is a sequel to Jacky the Brave, was launched in September 2017. Dangerous Danielda was Jim’s first children’s story. It started out as a pilot for a TV series but he decided that the story would be more interesting for young readers. When not writing, renovating his house or walking the dog, Jim is a musician with three original songs on iTunes and Spotify. Danielda was frozen with fear, her feet unwilling to move. She was standing in the centre of a huge store, which was filled as far as she could see with shelves stacked floor to ceiling with delicate glass trinkets, piles of china plates and crystal glasses. Running between the delicate displays was a narrow aisle, barely wide enough to walk through with many of the delicate ornaments hanging over the edge of the shelves, inviting disaster. Danielda was clinging to a ridiculously oversized shopping cart that barely fit the aisle. It was heavy with sticking, wobbly wheels that flapped back and forth as they moved, making it hard to steer. She had no idea how she got there, but the store was so large she could barely see past the shelves of glassware to the far away doors. Danielda could hear her mother calling, she knew she had to get out of there. Sweat formed on her hands, making her grip slippery on the plastic handle of the cart. Even though she could hear the sounds of the store, music from hidden speakers and distant noises of movement, there were no other people in sight. Only the urgent, almost demanding sound of her mother calling. Danielda forced herself to move, to push the resisting cart forward. It was heavy and she saw it was weighed down with large, grey cement blocks. As she pushed, the cart’s wheels kept catching and turning, threatening to slip out of her grip and collide with the shelves full of glass. Panting with effort and growling with frustration, Danielda couldn’t even remember why she was pushing a cart full of bricks through a giant china shop, but that didn’t matter anymore. She needed to get out and find her mother. She stopped again and looked desperately for a door or an exit sign, or someone to help. All Danielda could see was glass, glinting in the sunlight that shone in from somewhere. The glasses were stacked like pyramids, twenty or thirty high. That was crazy, why would someone do that? The pyramids were on skinny shelves barely wider than the glasses themselves. On the shelves were small, printed signs that read, “You break it, you bought it.” It was a disaster waiting to happen and Danielda was stuck in the middle of it. She had to get out of there. She carefully concentrated all her strength on the handle and pushed the massive, clumsy cart slowly around each table, avoiding the glasses. The cart kept pulling to one side, threatening to lose control. Her progress was painfully slow and now she had to pee urgently. Inch by inch the cart rolled past the tables, around this one, back around that, her hands slipping as the sweat dripped over the handle and her arms ached from gripping. Suddenly a front wheel swivelled and the cart lurched toward one of the tables, tapping it with the fat rubber bumper. The stack of glasses shivered threateningly but didn’t fall. She froze in position and held her breath as the sound of glasses rattling gradually settled. She exhaled, no disaster, but a close one. She doubled her efforts to control the cart and rolled carefully around the last table. The doors stood in front of her, bright and promising. She was almost free and not one glass was broken. She wiped her hands on her shirt and exhaled. Her escape was directly ahead and nothing stood in her way. She grabbed the bar of the cart and pushed boldly ahead. Except, she hadn’t noticed that a single thread from a tablecloth under one of the stacks of glasses had snagged onto a metal corner of the cart. As Danielda pushed her cart toward the door, the thread pulled longer and longer until it reached the end and the rest of the tablecloth tugged from under the stack of glasses. They toppled over with a deafening crash, but that wasn’t the end of it. Those glasses hit the next table, and the next until the stacks of glasses started falling over like an endless line of dominoes, all pushing into the next pile. The momentum built until the tall shelves behind them fell over and they fell into even larger stacks. The sound of shattering glass grew louder and continued for what seemed like an eternity. The smashing sound was like a waterfall and, over that, she heard her mother calling her. Danielda felt the world falling away from her. “It wasn’t my fault! It wasn’t my fault,” she sat up, screaming at the top of her lungs. Suddenly she was awake, startled by the sound of her own voice. When she opened her eyes she saw her mother standing in her doorway, wrapped in a towel and looking puzzled. The sound of the shower hissing behind her. “What’s not your fault?” she asked. It was a dream. Thank goodness! There was no store, no glasses, no disaster and she hadn’t broken anything. Her mother continued to stare at her. “Nothing, I was dreaming,” Danielda rubbed her eyes and flopped back on her pillow. Danielda suddenly remembered that she had an urgent need to pee, “Just a minute, I need to go to the bathroom.” She threw off the covers and ran past her mother, slamming the bathroom door. Her mother groaned and stamped her foot. The sound of the shower continued as Danielda sat at the kitchen table, eating cereal and thinking about the coming day. Sunshine lit the apartment with its promise of a warm, early autumn morning with the leaves starting to change colour. Everything was going to be perfect because this was a special day. She had been waiting for weeks and it was finally here. It was even marked in red on her calendar with one word: Change! Yes, she said to herself, starting today, things were going to be different. Danielda was ten years old with brown, shoulder-length hair and light brown eyes; hazel coloured, like the nuts. She was tall for her age and skinny, which meant she stood out from the other girls in school the way a giraffe stands above a herd of zebras. Difficult to disappear in a crowd, she was an easy target for them to make fun of, which they did with relish. In spite of the fact that she was sometimes socially awkward in school, Danielda was always courteous and friendly to strangers, old people and anyone who was nice to her. She was smart, always scoring the highest marks in class. Danielda would have been the perfect role model for any young girl, except for one thing – an unfortunate talent that Danielda hated, called “the curse”. She was, as her grandmother liked to say, a little accident-prone. She first said that when Danielda was a baby and her mother had dressed her in a cute little outfit to go to dinner with the family. Her grandfather was putting on her shoes, a pretty white pair with hard soles, when he tickled her and Danielda squealed, kicking her feet. The hard toe of the little shoe nailed her grandfather in his face, causing a bruise and a nosebleed. They were half an hour late for dinner and he had to change his shirt but everyone laughed when they heard the story. Her grandparents continue to tell that story along with the rest of the large collection of Danielda’s “accidents” whenever they had a family get-together, which Danielda hated. These incidents were never her fault but she was always caught in the middle and always got the blame for whatever happened. It was as if fate or nature or some secret government agency was out to ruin her life by making her out to be a troublemaker. “No more,” she said to her Cheerios, which were floating peacefully in her bowl. Starting today things were going to be different because, in spite of her frustrating dream, she was finished with the Curse. Today was the first day of the new Danielda. To begin with, she was going to be mature and start taking the bus to school by herself. Danielda’s mother had driven her every morning but, now that she was starting a new job, they both decided that Danielda could get to school on her own. That’s why they had to wake up earlier than usual. Their new schedule meant she and her mother had to be out the door by seven o’clock to be at the bus stop on time so her mother could get to work by eight. Danielda had packed a book to read on the bus along with the homework she was going to review. Last night she and her mother made lunches together and drove the bus route after dinner so that Danielda could note all the important landmarks to watch for on the way so she would know when to get off. Then they stopped for ice cream. They finished breakfast. Danielda was dressed and ready and they were out the door at exactly seven o’clock. They walked to the bus stop and arrived with five minutes to spare. As they waited, Danielda replayed the route in her head. She knew exactly what to watch for and precisely when to get off. Finally, a low-pitched rumble could be heard coming up the block and the big blue and silver bus drove around the corner and pulled up to the curb. When it stopped and the doors opened, they revealed a grey-haired driver sitting behind the wheel, staring ahead at the road. He munched on candies and didn’t pay any attention to the passengers coming on board. When Danielda dropped her coins in the slot, she spoke to him but he didn’t respond. He kept crunching his candies as he reached over to close the door and was startled when he saw she was still staring at him. “I said, good morning, sir,” Danielda put on her brightest smile. Danielda smiled at the other passengers as she walked to an empty seat halfway down the bus on the driver’s side. Everything was going well so far. She waved to her mother who was waiting on the sidewalk watching as the bus pulled away. Did she look sad? No, Danielda said to herself, not sad, just thoughtful. No one would be sad today. Her plan, the Project End-the-Danielda-Curse was in action. Catching the bus by herself was no big deal. Other kids at school did it all the time; some even complained about it. But this was different for Danielda. It was something positive, which was good because there had been a lot of changes to her life during the past few weeks. Danielda and her mother lived in a sunny, roomy apartment in a high rise building close to the river. Her mother worked at the local newspaper in the graphics department. She made advertisements and created artwork on the computer. She was a really good artist and drew lots of pictures of Danielda as she was growing up. But the newspaper had to “let her go” (her mother always said that with air quotes) and she had to look for another job. It took a long time and Danielda knew her mother was getting worried, no matter how much she tried not to show it. She eventually got a new job at an advertising company but it didn’t pay as much, so they had to move from their nice apartment into an older, cheaper one farther away. The change was hard. Her mom didn’t like the new apartment. It was dark and smelly, and instead of having lots of floors and a pool and their own laundry and an elevator, this apartment building had only three floors, one laundry in the basement and a huge sign reading “no pets allowed” on the door. All they could see outside were some old trees and other buildings just like theirs. Cars often raced up and down the street and sometimes they could hear people having loud parties or arguing as their voices echoed down the block. While all of this bothered her mother, Danielda didn’t mind. The only things she didn’t like about the building were the large, heavy security door in the front, which was hard to pull open, and the 52 stairs and three landings she had to climb each time she came home. The apartment itself was nice and clean. The only part that really mattered to Danielda was her room. This was her private spot filled with her own stuff, her music, her books, her art, her desk and her bed. The bookshelves were absolutely full of books with one shelf specifically for her diaries, which she had been keeping since she learned to print at age three. She could remember every day of her childhood through these pages. Her earliest diaries were full of colourful printing and drawing and her newest ones were accurate recollections of the events of each day, written in her perfect penmanship. Danielda had a routine. She walked into her room at the end of the day, carefully laid her homework on her desk for later, and then she would write in her diary every detail of every incident, accident and misunderstanding that happened in full detail. This would be her proof later in life when she would finally show the world that the things that happened around her were never her fault. But now things were going to be different. Nothing bad was going to happen. The city rolled by as the bus hummed. Danielda tried reading her book, but the sights outside the window proved far too interesting. Everything seemed brighter and more interesting in the daylight. There was more traffic on the street and more people walking around than last night when they drove the route. Sunshine reflected off the windows of the cars and there were so many different people doing so many different things it was hard not to get caught up in the action. The book sat on her lap on the same page for the entire trip. The people inside the bus were interesting as well. One man sitting on the seat across from her was fast asleep, his head nodding with the movement of the bus, like a life sized bobblehead version of himself. Some kids sitting toward the back of the bus talked loudly and listened to loud music with their huge, colourful headphones. The noise seemed to radiate out of their heads with a strange, tinny sound. It blended with the rest of the noise of the bus, the low hum that came from the engine and the bump and tick of the tires. She could hear half a conversation from a woman talking on a cell phone, the rustle of newspapers and the dull tapping of fingers on glass as people typed on their various electronic screens. It was all just a beautiful soundtrack for her first day on the bus. At the front, across from the driver, sat an old man wearing what seemed like a worn and faded bus driver’s uniform. The man alternated between muttering to himself and sleeping. Every now and then he would wake up and startle people by yelling out “Back of the bus please” or “That’ll be thirty five cents there Sonny. You ain’t no eight year old” or “Exit through the rear doors please”. The driver ignored the old man’s outbursts and drove on in silence, munching on candies. It was funny watching the old man dropping his face to his chest while he slept, then jumping to life and yelling out, then falling asleep again like the mechanical Santa at Walmart. Danielda wondered if that’s what old people did when they left their jobs. Did they just sit around on busses and watch other people go to work? Aren’t they supposed to do fun stuff when they retire, like travel or work in the garden? Why wasn’t the old man on vacation somewhere instead of riding a bus? Seemed kind of sad. Suddenly Danielda realized that everyone else had gotten off. She was sitting by herself in the middle of the bus with only empty seats between her, the driver and the old man at the front. She looked outside to see where they were and was startled to see her stop was coming up right away. She hadn’t been paying attention like she promised and almost missed it. She quickly put away her book and, for the first time in her life, reached up and pulled the cord. The mechanical voice said Stop Requested, and the bus rolled to the curb. Danielda walked to the front door, her bag and books bundled under her arms and a big smile on her face. “Thank you for the ride, sir,” she said as she stepped off the bus. The doors closed and the bus drove off. So far Danielda’s project was off to a spectacular start. The bus stop was directly in front of her school. Danielda looked at the building and took a deep, calming breath. Nothing bad was going to happen today. She carefully crossed the road, walked into the side door and down the hall to her locker. It was past the gym, around the corner, second last locker on the right. It was next to her best friend Lorinda and across the hall from her only known enemies, Brittany, Ashley, Chelsea and Kyle. Danielda hoped that, having started her day in such a positive way she would feel confident when she got to school. But no, when she turned the corner to get to her locker, she saw them there, staring and smirking and she felt that same twist in her stomach. She knew what they were going to say and she dreaded it. Every morning, as the other kids put their stuff away to get ready for class, find their friends and talk about what they read on Facebook, Brittany and her gang stood by their lockers waiting for Danielda to arrive so they could mock her. Every day the same burning, nagging feeling grew in the bottom of her stomach when she saw them. Today they were particularly giddy to see her. Danielda tried to ignore them as she walked to her locker and opened it. “Hey, there’s Dangerous Danielda.” Brittany taunted her in a sing-song voice. “Did you hear what she did on Friday?” she was speaking loudly, getting the attention of the others around them. Danielda’s heart sunk. Friday had been the worst. Danielda’s “accidents” were legend at her school. Anyone can make a mistake and Danielda tried so hard to be careful but, no matter what she did, bad things always happened. Without meaning to, Danielda would leave behind a trail of flooded toilets, spilled drinks, broken computers, flaming science experiments and splattered mounts of fruit behind her. A growing number of angry teachers, store managers and janitors blamed her for everything that went wrong. What was worse was that Brittany and her friends always heard about them and loved to spread the gossip. As a result, everyone, even the teachers, were constantly talking about her. She had her own Fan page on Facebook, even though Danielda had never once been on Facebook. No matter how many good things Danielda had done, all that anyone knew about her was that she was a royal klutz. But it wasn’t fair, it wasn’t her fault. Other people made mistakes and blamed her for them, even when the evidence clearly showed that she was an innocent bystander. There was one Saturday, when Danielda and her mom were driving to her piano lessons when they pulled up beside her principal, Mr. Barkus, at a traffic light. He had his head down and was reading something in his car with the windows closed. Danielda called and waved to him but he wouldn’t look up so she reached over and beeped the car horn to get his attention. Mr. Barkus jumped, waved his hand, put down his phone and drove away without looking. Unfortunately, the light was still red and he smashed into a garbage truck. No one was injured but the traffic came to a complete stop and the Police had to come and clear things up. Danielda missed her piano lesson, but she was more worried about the way Mr. Barkus scowled at her. Another time, Danielda’s Girl Scout troop was going to sell cookies at the mall to raise money. She had to carry the troop’s flag, which was mounted on a metal pole, into the building. She was afraid the automatic doors were going to close and bend the pole. So, when the doors opened, she ran through them as fast as she could, holding the pole up over her head and yelling to warn people at the top of her lungs. What happened next was not her fault. The man who was carrying several boxes and walking toward the door wasn’t paying attention. When he looked up and saw the screaming girl coming straight at him, holding the pole like a lance, he panicked, spun around and tried to run away. He ran into another man who was walking past, knocking him into a shopping card that was being pushed by a lady who was texting on her cell phone. When she looked up and saw the man sitting in her cart, she screamed and pushed the cart away. The man in the cart, who was also screaming, was wedged in so tight that he couldn’t get out as the cart picked up speed. It ran into an old man who was standing in front of a large fountain, who ended up being pushed into the water with a loud yell and a louder splash. Soon everyone was screaming and security guards were trying to calm people down and find out what was going on. Eventually everyone agreed that the whole thing was Danielda’s fault. But last Friday was worse. It was during lunchtime. Danielda was having problems getting the straw into her juice box. One of the cafeteria ladies came over to see what she was doing. At that moment Danielda gave a mighty push and drove the straw through the hole into the box that she was gripping, probably a little too tight. The juice shot out of the straw like a fire hose and hit the woman’s face so hard her glasses flew off. She ran around screaming “my eyes, my eyes!” Danielda was sorry and awfully embarrassed but she didn’t think the lady had to go on screaming like that. The worst humiliation came when the other kids started laughing. Brittany, Chelsea, Ashley and Kyle started chanting: “Dangerous Danielda, watch out for Dangerous Danielda.” Soon everyone in the room was chanting too. The laughing, screaming and clapping drove Danielda outside, without her lunch. “Hey Dangerous Danielda, what are you going to destroy today?” sneered Chelsea. Kyle snickered and Brittany smiled, proud of what she had started. Danielda picked up her books, closed her locker and walked as fast as possible down the hall. Her friend, Lorinda caught up to her. “No, I’m going to complain.” Danielda marched directly to her classroom and found Mrs. Hart at her desk. Lorinda sat down next to the door. Mrs Hart looked up and saw Danielda, her eyes went wide and she held the papers down on her desk. “What’s wrong Danielda?” she asked. “They’re calling me names. Brittany, Chelsea and Kyle, they’re making fun of me,” Danielda’s chest heaved with an angry sob. “Dangerous Danielda,” she said with a sob. Mrs. Hart blinked, frowned and put her hand in front of her mouth. She slowly turned red in the face as her eyes bulged. Danielda had expected her teacher to be as outraged as she was. She expected Mrs. Hart to march down the hall and have those kids hauled off by the police for making fun of her that way. She waited, anticipating justice. Mrs. Hart looked like she was about to burst, her face grew redder. But instead of crying, she was — laughing! Mrs. Hart was laughing at what they said. Not only that but, when she saw another teacher walking past the door, she ran out to tell her. Then both women howled with laughter, holding each other for support. Lorinda walked over to Danielda, picked up her books and they walked out of the room together, past the snuffling women. Danielda didn’t look up as she walked by her teacher, but she’d show them. This day was when everything was going to change. By the time Math class began, Danielda had regained her confidence. Brittany and her joker friends were not going get to her today. No, things were going to be different. Danielda would be extra careful and not say or do anything that could become a catastrophe. Nothing, absolutely nothing would go wrong. She made it her life goal. And it worked. Not one thing went out of place or fell over as she walked by. Jerry Zarowny slipped in a puddle of water and dropped his books. Everyone looked around for Danielda but she was nowhere to be found. She had managed to duck around the corner at the first hint of commotion. The day seemed very long but, when it was over and Danielda caught the bus home, it had been a perfect first day of her new project. She walked to the apartment building and used her key to open the front door. She was anxious to write everything that didn’t happen into her diary. It was hard not to be disappointed. Danielda had been looking forward to telling her mom all about her bus ride and the way nothing had gone wrong all day, and how she showed up Brittany and her stupid friends. Besides, she had already locked the door. She didn’t need to be told that sort of thing. Oh well, she sighed. She warmed up her dinner in the microwave and settled down to write in her diary. Amazingly, Danielda’s luck held out both Tuesday and Wednesday. She began her mornings by catching the bus. Each day the old man in the front continued to snooze or blurt out instructions. Sometimes he yammered on at the bus driver about his experiences driving a bus and bragged about his expertise. No matter what he said though, the bus driver kept on chewing his candies and ignoring the old man. Danielda noticed a man reading the classified ads in the paper. She felt sorry watching him because she thought he might be looking for a job or an apartment. She had seen her mother looking the same way when she needed to find a new home for them. Then she saw another man who looked like a student, reading a book on engineering. She got an idea and began taking notes about all the people who rode on her bus and made up stories about their lives based on what she saw. This made the bus ride more interesting, like a television show or a series of novels. The people were her characters and they played out their stories each day on the bus. The girl sitting in front of her liked the guy two seats up but was afraid to say anything. Will he notice her one day when he casually looks up? Bobbing Head Man had a secret life as a singer and wanted to be famous rock star. He sang with a band at night and then ran home to change for his regular job. He was always sleeping at work, even at meetings. They called him Sleepy Bob. The man in the suit who as always typing on his computer was actually a foreign spy keeping track of the other man who was always typing on his phone, who was also a spy. Danielda wrote these stories until they filled up her book. She was always the last person, other than the old man, to get off the bus and she always said good-bye to the driver. She did this on purpose to make sure her day started right. It was a superstition but it seemed to be working so she stuck to it. She would walk into school and ignore the looks from her enemies while she smiled inside at their frustration. The best part was that Danielda managed to avoid having any accidents at all – mostly. Once she accidentally switched her teacher’s computer to Spanish and couldn’t read the words to switch it back. Fortunately, Mr. Sanchez, the caretaker, came to the rescue and fixed the computer in time. He winked, this one didn’t count. Another time, the following week, Mrs. Hart wore a sweater that she had knitted herself. It was her first try and it wasn’t made very well. There were some strands sticking out and one of them caught on Danielda’s charm bracelet as she walked past and it started to pull. The thread pulled and pulled without either of them realizing. Mrs. Hart walked into her room and closed the door while Danielda continued walking down the hall with the thread still stuck to her. Danielda felt a tug on her arm, she stopped and looked at her bracelet. The wool had pulled off so there was nothing to see. She shrugged and kept walking. By this time the thread had pulled down the hallway and other kids were pulling on it and tripping over it and playing with it. Suddenly there was a loud scream from Mrs. Hart’s classroom. Danielda paid no attention, it had nothing to do with her. The following Wednesday, as she was walking down the hall to the library, Danielda passed Mr. Sanchez trying to fix a broken tap on a drinking fountain. He was pulling hard on the wrench and grumbling in Spanish as the tap refused to budge. Somehow Danielda knew a disaster was about to happen and she was standing right there, where everyone would see her. She quickly turned, ran around the corner and then walked down the hall, forcing herself to look calm. When she was a partway down the hall she heard a metallic clank, the spray of water and Mr. Sanchez yelling in Spanish as water gushed on the floor. She ducked into the washroom and hid. No one saw her. The other kids at school were getting antsy. Normally classes with Danielda ran shorter than usual because something always happened to distract the teacher and they would get out early. Without those events, class was boring. They were getting impatient for something – anything to happen. Everyone was watching Danielda anxiously. “Why is everyone staring at me?” Danielda asked Lorinda on their way to lunch. “You haven’t had any accidents. Nothing’s happened for them to talk about,” Lorinda said. Danielda looked back at the grumpy faces and grinned, Project Danielda-isn’t-such-a-klutz-after-all was taking effect. Even the teachers grew impatient. Danielda’s accidents were their general topic of conversation at school. “Have you noticed how quiet it is around here?” Danielda overheard Mrs. Hart talking to Mrs. Nutwitch. “Nothing’s happened, that’s the problem,” Mrs. Hart sighed. On the Friday, there was a terrible crash coming from the art room. The noise could be heard down the hall. When Mrs. Hart, along with most of the other students, rushed in the door they saw dozens of cans of paint strewn about the room and the floor covered in every colour imaginable. Brittany and Chelsea ran into the room. “It was Danielda, we saw her,” they chimed like cheerleaders. Their faces were flush with excitement. There was another crash as more paint cans fell off the pile. From underneath came a groan and a paint-covered Kyle, crawling up from the rubble. Mrs. Hart looked at him, then the girls, and her face glowed red. Kyle slouched as he walked past her to the door. The girls stared at the floor, then turned to leave. For the next month Danielda didn’t touch anything, or put her hand up to speak. She ate her lunch outside by herself and read a book. Sometimes she talked to Lorinda when she wasn’t busy. Lorinda was always doing something at lunchtime; choir, sports, science club. Danielda thought it was nice to be left alone for a change, but it was becoming boring. She wasn’t being herself anymore. She was completely locked up inside for fear of what might happen. All at once, everything changed and Danielda’s new fortunes came to an end. The class was working on their math when Danielda’s pencil broke. She had been extra-careful to make sure she always kept a good supply of sharp pencils on hand, but she left them in her locker by mistake. With horror, she realized there was no choice; she had to use the sharpener. Fear gripped her insides. She got up from her desk and walked casually over to the sharpener by the door. Even though she tried to look casual she knew that every eye was following her. Slowly, carefully Danielda put her pencil in, turned the handle and ground the end to a sharp point. Then she strolled back to her desk and sat. The room was silent and all eyes were still on her. She calmly exhaled and looked around at everyone staring at her. She smiled sweetly. See, nothing happened. At that precise instant, the sharpener made a small clink sound as it fell off the wall and hit the floor. Upon impact, pencil shavings exploded into a small black cloud that covered the floor. Everyone watched it happen but no one moved. Then a boy named Michael started to clap. Soon everyone joined in. Mrs. Hart watched for a moment, mouthed the words thank you to the ceiling, then stood and held up her hand. “That’s enough, everyone. Lorinda, would you go and ask Mr. Sanchez to clean this up, please?” She looked at Danielda, “It’s good to have you back,” she said with a grin. Danielda groaned as she looked at the mess and the happy faces in the class. This was never going to end. Even Mr. Sanchez winked at her as he swept up the pile of shavings. “I was getting worried about you.” he said, chuckling. The days grew colder. Waiting for the bus became uncomfortable. The driver was the same and the old man still sat in the front seat, snoozing or talking to himself. There were several new people on the bus, but most were bundled up for the cold and Danielda couldn’t see them well enough to make up stories. The driver kept chewing on candies. They were hard and crunchy and he was constantly munching on them. Danielda hadn’t noticed that before. She wondered how she had missed it. Everywhere you looked there were ads for Christmas. Danielda’s mother used to make some of the best advertisements in the newspaper. It was fun looking in the paper and seeing her work. Now her mother worked on things that were happening months ahead, like summer clothes and new condominiums. She was tired all the time too, always working late. There were only a few weeks until the holidays. Danielda was still looking for a present for her mother. She was also really looking forward to the Christmas concert at school. Her mother promised to come to it. She wasn’t the only one looking forward to the concert. Mrs. Hart was the Christmas queen of the school. Mrs. Hart lived for her Christmas pageants and took great pride in the performances of the choirs and plays. She put a ton of work into the stage props and the costumes and she made sure every kid at school had something to do in the play. There would be no goofing off, no talking backstage. Christmas was very serious stuff for Mrs. Hart. More than anything, she was absolutely particular about timing for the complicated scenes. Everyone had to practise over and over to get everything right. They rehearsed the lines and the songs so many times some kids started to say each other’s lines by mistake. “I’m really starting to hate Oh Little Town of Bethlehem,” complained Lorinda, one day after rehearsal. She was one of the singing angels and Mrs. Hart insisted Lorinda sing her song as a solo. Lorinda could sing well, but she got nervous and mixed up her words, which meant they had to do it over and over again. Some of the other kids found the pageant boring, but not Danielda. She loved the whole idea of Christmas. Mrs. Hart struggled with her decision but eventually she found a part for Danielda that seemed safe enough. At one point during the play she was to pull the Star of the East over the stage. It ran on a long track, like a curtain rail, and she was to pull on the string to wheel the star along, following the three wise men who were boys from her class and looked goofy in their beards. Because Danielda had to walk behind the stage to pull the string, and Mrs. Hart was in the front directing the play, there was no way for her to signal Danielda when to pull the star. There were other kids whose jobs were pulling down the moon and dropping snow from the large shakers full of confetti overhead. Because all the other teachers were busy with their classes, they had to bring in Mrs. Grey, the school secretary, to direct the action backstage. Mrs. Grey was known by most of the kids, and some of the teachers, as Mrs. Grouch. Stories about Mrs. Grouch were legend, passed down from grade students to Kindergarten over the years. Mrs. Grouch never actually wanted to work at the school but she had been forced to by circumstances. She got this job 30 years ago because her husband lost all of their money on his business. The stories were that the business did well, but Mr. Grey didn’t actually deliver anything he sold, so he went to jail. Everyone knew Mrs. Grouch hated kids almost as much as she hated her job. Now, when she was only a year away from retirement, she was miserable that she had to spend her evenings sitting backstage at school watching kids when she could be at home watching TV. The only other thing Mrs. Grouch disliked as much as her job was anything electronic. She hated cell phones and the Internet. Her electric typewriter was as close as she ever got to a computer. So, when Mrs. Hart handed her a pager, she went red in the face and scowled even more. “I will beep you when it’s time to cue the kids,” instructed Mrs. Hart, who then scampered off, leaving Mrs. Grouch alone backstage with her bad mood and Danielda. The audience had filled the gymnasium. Danielda peeked around the corner and saw her mother sitting in the centre, four rows back. She was chatting with Lorinda’s mother when she spotted Danielda peeking out and waved. Danielda beamed as she returned to her spot backstage. Everyone was getting excited. Some kids started goofing off. Brittany, who played Mary, whacked Kyle, who was Joseph, over the head with the baby Jesus. The shepherds chased each other with their crooks, everyone was getting loud. Mrs. Grouch ordered them to be quiet, glanced at her pager and put it down on the table. Danielda was holding the string to her Star of the East when she heard this. She wasn’t sure if Mrs. Grouch was talking to her but she knew what a pager was. Her mother had used one before she got her cell phone. She also knew they could be set so they wouldn’t beep and wouldn’t scare poor Mrs. Grouch. She picked up the pager and switched the alert from Beep to Vibrate. Having taken care of the problem without needing to be thanked, Danielda felt certain that things would go smoothly for the rest of the evening. The play began to the hushed auditorium. It felt hot backstage; everyone fidgeted in their costumes while waiting for their cue. Some of the kids in the choir grew restless and began to fidget. Mrs. Grouch shushed anyone who made a sound. She clutched her pager tightly in her hand and shook it. Danielda waited patiently, but even she was getting bored. During rehearsals, she had been able to see what was going on. But now the fake sky was up, which was really a large sheet painted dark blue, and she couldn’t see anything. She sat and waited for her cue. Onstage, the three wise men came out. It was time for the star, the moon and the snow to appear. Mrs. Hart dialled the number on her phone and Mrs. Grouch’s pager jumped to life. She was holding the pager tightly in her sweaty hand. In fact, she had almost forgotten it was there until it suddenly started to vibrate and buzz. The pager sailed into the air and landed on a drum, which amplified the pager’s vibrations and making it sound like many more bees. Until that instant no one knew that Mrs. Grouch had apiphobia — a fear of bees. The louder buzzing noise sent Mrs. Grouch into a blind panic to get away from the stage. Everyone, including Danielda, had to jump for safety. Mrs. Grouch ran around like a crazy person, certain that she was under attack. From the front of the stage, the loud screaming was the first hint that something had gone wrong. Next came the sound of objects falling and breaking. The Star of the East shot across the sky like a meteor. The sky itself started to tear and fall down. The stable fell on top of Mary and Joseph. Soon all the kids were screaming and running around. All Mrs. Hart could do was watch her perfect Christmas pageant collapse into a heap on the stage. When it was over, Danielda stood alone in the centre of the ruins. She blinked at the lights and looked at a gym full of people who stared back at her. Offstage came the sound of Mrs. Grouch, still screaming, “The bees, the bees!” Mrs. Hart ran to the back of the stage, as kids bolted in every direction. Danielda’s mother crawled over the legs of fellow audience members who were either laughing or yelling angrily. She walked up the stage and guided Danielda out the side door as quickly as possible. Danielda felt pretty sure this would go down as the worst day of her life. As it turns out, she was wrong. TUNE IN NEXT SATURDAY FOR PART 2 OF “DANGEROUS DANIELDA” BY JIM SELLERS!